At Charney's, we understand how important jeans are to your wardrobe, and we've been outfitting men in jeans for over 64 years. A jean should fit comfortably, but still mold to your body in a complimentary way. At Charney's we carry the traditional 100% cotton Levi's Jeans, in all styles and sizes, but we also have jeans with cotton and lyrcra blends that are so comfortable, you won't think you're wearing jeans! If your jeans aren't fitting you the way they used to, or don't compliment you as you'd like them to, come in to Charney's and try on a pair of the latest jeans. We promise you'll be glad you did! 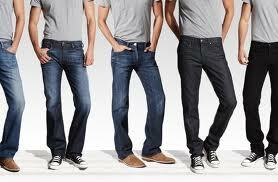 We carry jeans from a size 30" waist to a size 72", and lengths to 38". If you have any questions about our jeans department, please call us during store hours at 315-463-6011.